Heady days for a Trinidadian based Rover! 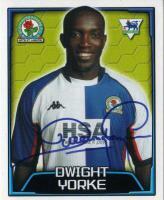 I chat to Dwight sometimes and he said Souness was an absolute lunatic on the training field. We had some team in those days. well, in the end business as usual and nothing happening. That said, this has been the most entertaining window since the Luca Toni days. Nice one Madon! We can take some comfort from the fact Rovers are now linked to some decent players, rather than the Luke Vardy's of this world. Glass half full - we've come a long way. At least Grabbi looked like he had something and got a goal or two. Compared technically to Brereton so far Grabbi looks like Messi. Brereton needs to go out on loan ASAP but I can't see him becoming a championship level forward. At 19 he may be 'raw' and have potential but as other posters have seen, there haven't been any flashes/moments of ability. Meanwhile Palmer, who we couldn’t get a tune out of, scores the winner for Bristol. Price tag, age, potential......put all of that aside - Brereton is a woeful footballer. 1-1 is a decent result. We lack quality and that is why we are mid table. This is a work in progress. Mulgrew was immense today and I thought Downing looked like a proper defender. Armstrong was shocking. Rothwell is technically superb, hopefully he can learn the other side of the game and develop his awareness. Middlesborugh are absolutely dreadful to watch, lucky we don’t sit through that every week. Onwards and upwards. Great draw - nothing to lose so go up there and in the words of G. Bowyer, ‘give it a right good go’ Play 4 up front. Then put Brereton on at left back for the last 10 minutes. The 7m man will be lethal in league 1! If he is allowed to start. This is absolutely staggering - to go 3 at the back when we are already defensively all over the place. Work to do Mr Mowbray. Deserved lead for Wigan. Rovers are shambolic currently.